The Garmin Edge 500 cycling computer is fantastic. It took a little while before I plopped down the money for this thing, and I’m glad I finally pulled the trigger. Cycling can be an expensive hobby. Being a guy who loves electronic gadgets can cost a pretty penny. When you combine the two, retailers absolutely love you. Originally I didn’t even have a cycling computer for my road bike. I was just using the MapMyRide app on the iPhone. It didn’t take long for me to get sick of launching the app, waiting on a good GPS signal, pressing start, then sticking the phone back in my pocket, clipping in and riding away. So I bought the trusty Cateye Strada Wireless computer. The Cateye is a pretty popular computer. I see them all over the place. It’s simple and it works. All you need, right. Well, I thought so. But then I wanted to know my cadence. Now I was basically kicking myself for not shelling out a little money for the Cateye Double (which measures speed and cadence). But Christmas was coming up. I discovered a reasonably priced alternative that would be a no-brainer Christmas gift for me, the Mavic Wintech computer. I asked for it, I got it. I was once again happy with my computer. Then came Strava. I had seen it advertised during some races. I thought it looked a little too fancy for what I was doing. Seeing how you stack up with others? I don’t care about that, I’m just doing this for fun. But, eventually, I fell for it. I downloaded the iPhone app. Now I was back to using the iPhone will riding. But this time in tandem with the Mavic. This just made the pre-ride start-up even more convoluted. Turn on the Mavic, reset the info, pull out the iPhone, launch the app, wait for good GPS signal, hit start, phone back in pocket, clip in, ride. Lordy. But, I loved looking at all of Strava’s nifty little charts and graphs. And the maps, what great maps. That did it. I had to get a GPS bike computer. One thing to turn on and it would give me everything I want. I looked around at a couple of different options. It was foolish really. We all knew what I was going to get. The Edge 500 is just the niftiest, most compact GPS bike computer out there. Sure the 800 has that touch screen and real maps. But I just wanted something to tell me how fast I was going, how fast I was pedaling and an easy way to stare at charts, graphs and maps when I got back home. 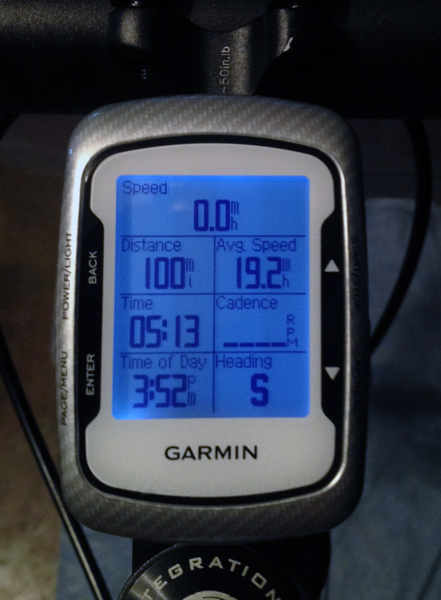 My Garmin Edge 500 after completing the 2012 100 Miles of Nowhere. In my in-depth research of the Edge, I saw that some people complained about corrupt files and such. Kind of scary. Did I really want to trust the electronic history of my ride to this thing that could corrupt files? But, in the end, there were just far too many great reviews. And after talking to folks at bike shops, it was an easy choice. I’ve had only two issues with it. One was caused because I’m an idiot. The other still sort of boggles my mind, but it turns out the issue only seemed to be an issue as I was riding, because the fine folks at Strava helped me out once I had my file uploaded. Neither of those problems were much to get worked up about anyway. This thing is awesome. It gives you more info than you would ever want or need. One of the big sellers for me after the GPS and the basics (speed, cadence, etc.) was the customizable training screens. You can put eight lines of information per page. And I believe you can have five pages now. That’s nuts. I use three. And really, I only use one. But I’ve got seven pieces of info on that page. It’s everything I want to know while I’m riding (speed, distance, avg. speed, time elapsed, cadence, time of day and heading). I like to know my heading so I can ride right into that headwind. My second screen is everything I like to know immediately after the ride (max speed, calories burned, average cadence and the temperature). My third screen is just set up to see how much I’m torturing myself (vertical speed, grade, distance, speed). Usually this is rather unimpressive. But I like to flip over to this page to see that the hill I’m climbing — which feels like a 10-percent grade — is really only two. I have somehow avoided buying a heart-rate strap so far. Though I have definitely thought about it. I’m interested in heart rate, but I’m just not sure it would be worth it, because I’m not sure I’d always want to fuss with the thing before heading out for a ride. Bottom line on this thing: it does everything I want it to, it does it simply and it doesn’t whine about it. It just works. That’s what I want in gadgets. That’s why I use Macs. The other great thing about it: It does way more than I want it to. As I get deeper into this cycling thing, maybe I’ll want to know my heart rate, maybe I’ll pony up some money for a power meter (though I doubt that). And if I do, I’ve already got the computer to handle all of those things. It is upgrade-ready. More stuff should work like this.